This is one of my regular disclosure posts. You can read more of them here. This one is about VeeamON 2018. 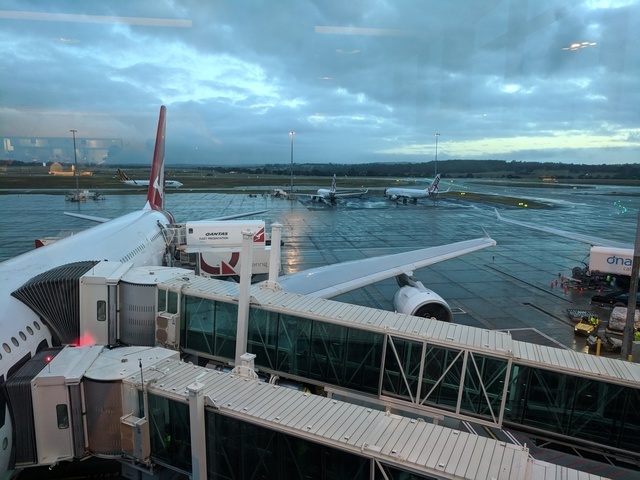 Loading of a Qantas A380 at Melbourne Airport on Sunday 13 May 2018. I was flown to Chicago on Qantas Economy class courtesy of Veeam. This was part of a series of conferences I was attending, so airfares were split between multiple organisations to save money. Accommodation from Sunday 13 May 2018 to Thursday 17 May 2018 was at the Marriott Marquis in Chicago, and was also paid for by Veeam. 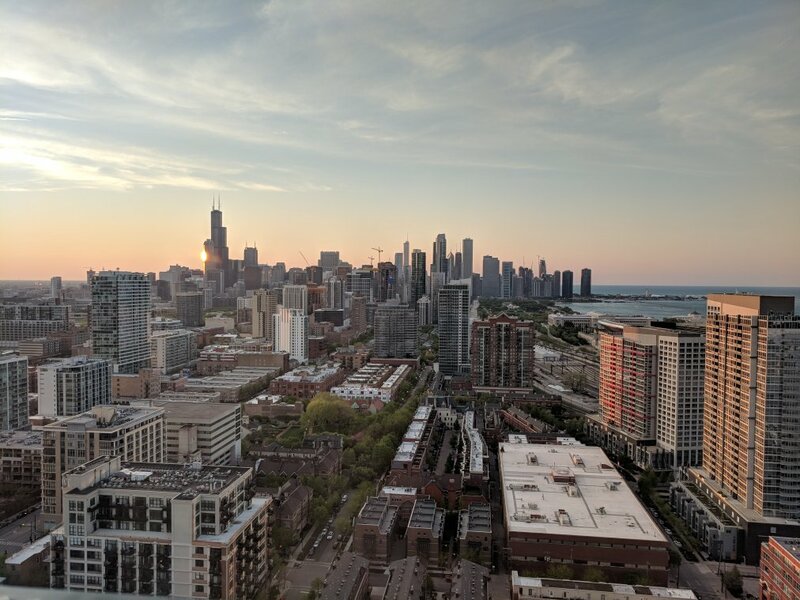 I then moved to the Hyatt Regency McCormick Place, which was right next door, for 2 nights 18-19 May 2018, paid for by PivotNine, i.e. me. I took a car service to the airport, also paid for by PivotNine, because it’s cheaper than putting my car in long-term parking for the two weeks I was to be away. My regular routine of poached eggs, bacon, mushrooms, spinach, toast, and a skinny latte at the Qantas fancy lounge at Melbourne international airport. Second breakfast was on the plane itself, which was a more lunch/dinner style meal. I think I had the chicken offering this time, but it’s honestly starting to blur together now. With it I had a couple of the little plastic bottles of wine to help me off to sleep and into the target timezone. Third breakfast was fruit and a cup of tea on the plane just before landing at something like 3am local time at LAX. Fourth breakfast was at the Qantas fancy lounge at LAX because their showers and coffee are nicer than the American Airlines lounges. Poached eggs and toast again, but no mushrooms because they weren’t on the menu, and kale instead of spinach. A latte, and then a second one because the first one didn’t quite work. I also had some of the potato chips from the massive jar of them that’s always there. I think I craved a bit of salt for some reason. I nibbled at a little lunch pack thing I got on the American Airlines flight, but I wasn’t really hungry by this point. There were some grapes and some crackers and American hazard orange cheese. Dinner was a turkey sandwich and a couple of local beers at the hotel bar. The beers were both something called a Daisy Cutter pale ale, and they were quite good. Breakfast was in the press area at the conference after picking up my badge. I started with some scrambled eggs and trialled the bacon but American bacon is a bit too greasy for my liking. I also had some fruit and a delicious fresh bagel with cream cheese. It helped offset the shock of conference coffee and the dawning realisation that this was the kind of coffee I would be having for the next two weeks. I discovered that a good bagel can help reassure you when you’re questioning your life choices. Later in the morning I caught up with Matt Leib (@MBLeib) for a chat about his hometown and life generally. We also bumped into Vaughn Stewart and Matt Crape (@MattThatITGuy) who gave me a Coffee Crisp from Canada. Matt also bought me a latte from Starbucks. Lunch was a snack in the press room. I don’t recall what I had, but it would have been some sort of bain-marie conference mass-produced food. Dinner was snacks at the conference venue, including something that purported to be a Chicago hotdog. I was reliably informed—by multiple people—that I was Doing It Wrong with my hotdog. It was tasty enough, but I’ll have to come back and have a proper hotdog at a baseball game some time. Breakfast was back in the press area. I had fruit and scrambled eggs again, but declined to have a bagel for reasons that escape me now. Lunch was at a press conference with the execs and I can’t remember what we had. Something pre-plated and mass-produced I think. I was concentrating on listening to the execs and asking impertinent questions. Dinner was canapes and various nibbles at a VIP reception thing on a high floor of the hotel. It had a very nice view. I also had two gin-and-tonics. The VIP moniker aside, this was worthwhile for me to attend because I got to ask some questions of Danny Allen, VP of Product Strategy, about what had been presented that day. It was a bit vague and buzzwordy, so it was really helpful to be able to get past the restrictions of a keynote structure and just talk about what Veeam were up to. The broadcast nature of a general session (particularly now that they’re recorded for re-broadcast later) means they tend to be very vague, particularly the ones that are aimed at C-level enterprise vision stuff. Personally I think this is a mistake, because vision needs to be tied to something concrete. “We are going to climb that specific mountain” is a good vision, because you can track progress and know when to stop, because you’ve reached the top. You also know not to stock up on canoes and paddles. But strategy is largely misunderstood and so people use a lot of buzzwords and nonsense rather than risk exposing that they don’t really know what they’re doing, though this doesn’t adequately explain why intelligent people who do know what they’re doing explain it so poorly using the same words and phrases the charlatans use. After the reception, I had a chat with some folk at the bar for an hour or so before bedtime. I paid for my own drinks, aside from a G&T bought for me by the Veeam comms team. Breakfast was… you guessed it! In the press room again. Eggs, fruit, coffee, and I recall a couple of quite nice pastries. I very nearly destroyed my laptop by filling it with coffee but managed to mostly miss it in a stroke of excellent luck. Lunch was press room stuff again. Some orichette pasta with a light sauce and (from memory) peas, and some sliced roast beef, was my selection. I really must start taking photos of these so I can remember better when there’s a gap of several weeks before I find time to write this all up. Dinner was at the VeeamON party, and was a little heavier on the pasta than I probably needed, though I’d been to the gym twice already this week. After chats with various people, both those I’d met during the week and some I’d known for a while, I nursed a G&T through the band’s final set and wandered off to bed. Breakfast was just coffee in my room while I tried to catch up on email and client work after an all-too-brief sleep in. For lunch I walked half a block to the local Paisano’s pizza franchise and ordered a thin-crust pizza and a side of fries. Yes, I know Chicago is famous for deep-dish, but I just couldn’t bring myself to do it. I also had a root beer. I ordered a large pizza knowing full well that I wouldn’t eat it all, and took the rest with me for dinner. Dinner was pizza and watching SciFi movies and episodes of The Expanse (which I’d never seen before) until probably later than I needed. There was so much pizza that I had it for breakfast as well. There is something just so wonderful about cold pizza for breakfast. I don’t know why, but it almost always makes me happy. I moved hotels at lunchtime and settled in to do some work for the afternoon. There was coffee in my room, which was all I felt I needed until dinnertime. Dinner was a burger and a couple of beers at the hotel bar, which I paid for. A Veeam branded Yeti thermos mug thing. A Veeam branded backpack from the conference.